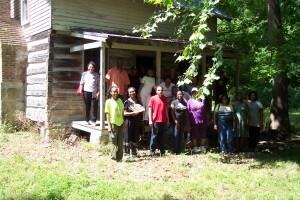 In addition to touring the grounds surrounding the Wessyngton mansion, National Black Arts Festival members and guests walked in the footsteps of Baker’s ancestor in the slave cabin area of the plantation. 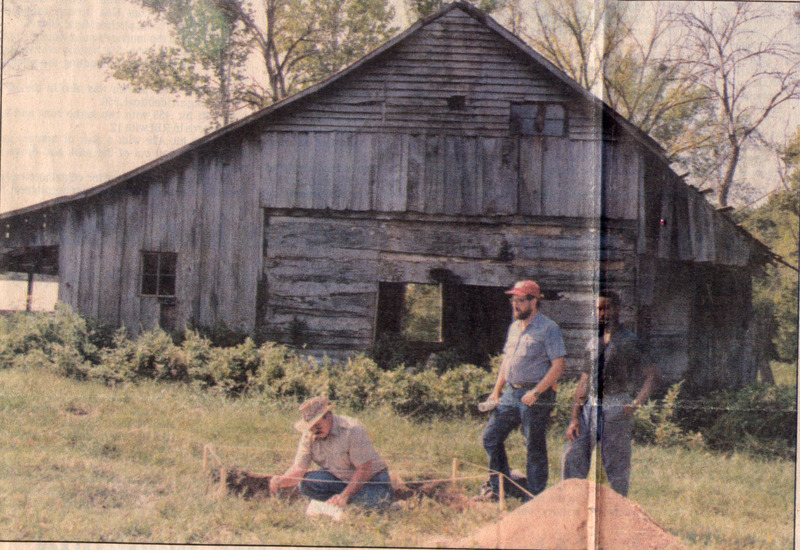 The group went inside a restored slave cabin built ca. 1830. In 1860, there were 274 enslaved African Americans on the plantation, housed in forty log cabins. At the onset of the Civil War, Wessyngton held the largest African American population in the state of Tennessee and was the largest tobacco producer in America. The following story sheds light on the impact of the Transatlantic slave trade on the lives of native Africans. 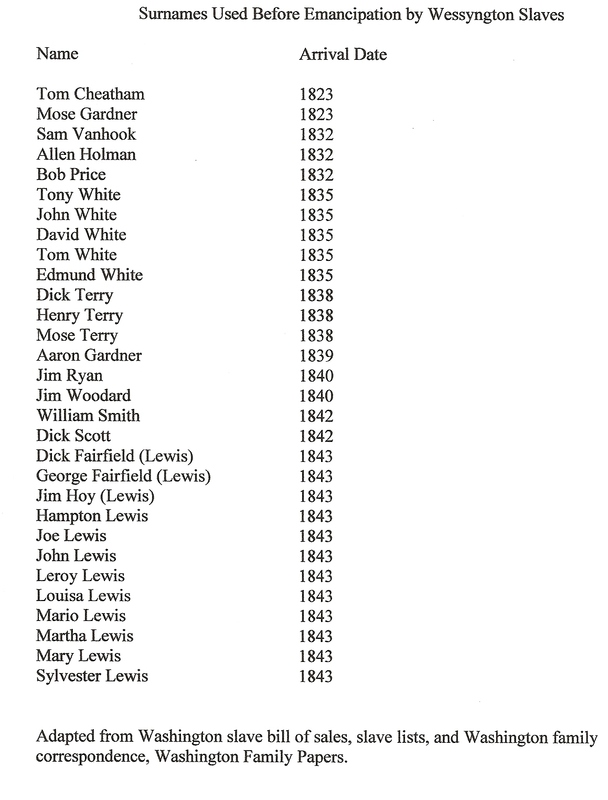 Some of these slaves ended up on the plantations of the Blow families. I found this story while searching through a Sussex County deed book looking for genealogical information and noticed the names of several slaves. What stood out most were the names of some of the slaves: August, September, June, April, Caesar, and Quaco. I then thought these were likely Africans. Some slave owners gave Africans the names of the months of the year or days of the week. Planters did not realize in some African cultures children were named for the days of the week they were born on, thereby continuing an African tradition. Names such as Samba, meaning born on Monday, which was later, corrupted to Sambo. The plight of the Africans was revealed in detail in a Virginia court case that lasted eighteen years. The story began in 1781 during the Revolutionary War. John Wigfall owned a large plantation at Wambaw on St. Thomas Parish in South Carolina. During this time, Wigfall was a Loyalist to Britain and was banished from the colony and had his property confiscated which included his slaves. At the same time, Captain John Singletary was issued a commission as a privateer in his cutter Victory. His commission ordered him to take as prize any British property. Captain Singletary and a small crew set out in rowboats up the Santee River and landed at Wigfall’s plantation, where they captured thirty-four of his slaves: April, Will, August, Dolly, September, Wally, Philander, Philis, Caesar, Horah, Scipio, Cloey, Daniel, Santon, Will, Neppy, June, Dianah, Pegg, Binah, Jenny, Peter, Cyrus, Duke, Flora, Limbrick, Pharo, Toby, Nanny, Sabina, Rosanna, Carolina, Wallis, and Quashilla. The slaves at first were taken to Beaufort, North Carolina. Although Wigfall was to be banished, he was granted leniency because he pleaded poor health and a large family to support and was allowed to remain in South Carolina. Thus, Wigfall made immediate application for the return of his slaves, as a Court of the Admiralty convened in New Bern and ruled that the slaves were a fair prize. They were declared property legally condemned by the court. After discovering that Beaufort was threatened by the British, Singletary took the slaves to Virginia and sold them to four planters: Richard Blow of Sussex County, who was the nephew of Colonel Michael Blow, Colonel Benjamin Baker of Nanesmond County, Captain Sinclair in Smithfield, and William Hines of Southampton. Wigfall was informed of the whereabouts of some of the slaves and managed to steal back a few of them, although some of their names had been altered to conceal their identities. Wigfall and his son and the plantation owners had several heated disputes over the ownership of the slaves. In 1792, John Wigfall gave his friend James Warrington of Richmond power of attorney to recover his property, to no avail. In 1798 his son Joseph, who was the executor of his estate pursued the case. The judgment in all matters of the case except the ownership of the slaves was in favor of the defendants. However, each purchaser had to pay Wigfall for the use of the slaves during the time they were in Virginia. Some forty years later some of the Africans were still living on Richard Blow’s plantation in Sussex County called Tower Hill. An 1830s register of slaves for Tower Hill lists August, Tember (September) and April, who was also called Joe, (possibly a shortened version of the African day name Cudjo) as being African Negroes. They died in 1832, 1826, and 1829 respectively, ranging in age from 60 to 80. Their names first appeared on tax lists for 1784 for Richard Blow when they were purchased. August probably suffered the greatest loss of all the Africans. 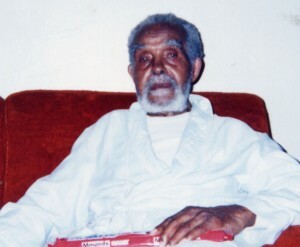 According to descendants of the Blows, after August learned English he and the other Africans related the story of their capture and voyage from Africa. August informed the Blow family that his father was an African king and he was next in line to succeed him to the throne but was betrayed by a jealous uncle who sold him to slave traders so he could rule as king. Instead of living the life of African nobility, August was condemned to a life of American servitude. Power of Attorney from John Wigfall to James Warrington 1792 to recover slaves taken from his Wambaw plantation in South Carolina, Sussex County Deed Book G pages 723-725. Federal District Court case, Richmond, VA Wigfall Vs Blow 1799, Virginia State Library and Archives. Register of slaves on the plantations of Richard Blow 1832. 1838 register of slaves of George Blow. Manuscripts Department of Swem Library, College of William and Mary. Register contains the slaves’ names, parents’ names, dates of birth and death, if the slave was acquired by inheritance, purchase or gift. 1784 Tithables for Sussex County, VA for Richard Blow. Virginia State Library and Archives. The Washingtons of Wessyngton Plantation: Stories of My Family’s Journey to Freedom has been released in trade paperback and is an excellent resource for teachers and educators. The book chronicles the African American experience from slavery to freedom. It has more than 100 photographs and portraits of African Americans who were once enslaved. The book covers many aspects of plantation slavery, the Civil War, Reconstruction, Jim Crow, Genealogy, and DNA testing. Slaves were usually known by their first names, especially on small farms with few slaves. Plantation owners rarely recorded their slaves with surnames unless they had several individuals with the same first names. For that reason the use of surnames by slaves was far more common on large plantations where more people were likely to have the same given names. 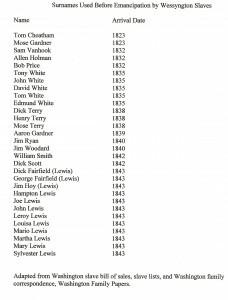 Due to Wessyngton Plantation having such a large enslaved population many African Americans are listed with their previous owners’ surnames as early as the 1820s. Slave bills of sale and other documents in the Washington Family Papers collection details the origins of many of these African American families. 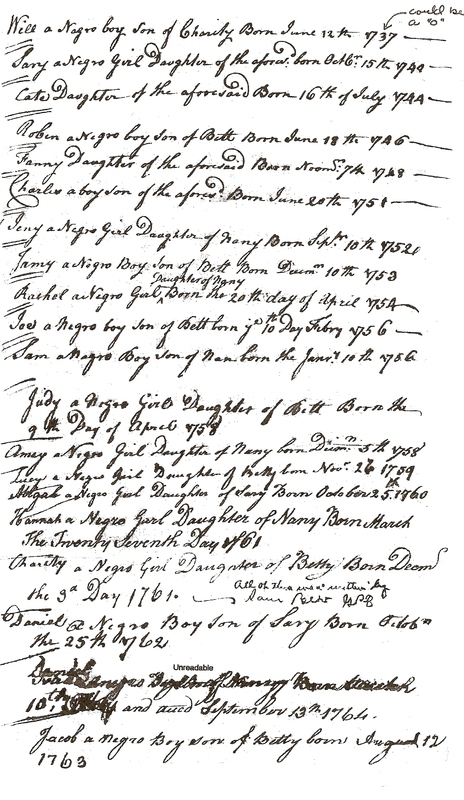 The list above documents the names African Americans on Wessyngton Plantation who used surnames prior to emancipation and the date of their arrival on the plantation. Slave owners kept detailed records of their slaves’ births, and deaths, and purchases; although many of them have not survived. They often recorded these events in their family bibles along with information on their own families. 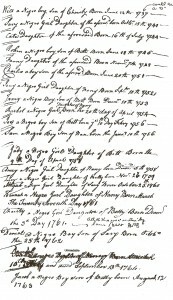 The 1715 Blow family bible records the births of slaves owned by the Blows of Sussex, and Southampton counties in Virginia. Nineteen births of four mothers are recorded from 1737 to 1763 spanning three generations. This is a goldmine of information for African American research. Descendants of these slaves can be found searching other records in the Blow Family Papers in the Swem Library in Virginia.